Choosing the right filing system for your office is tough, but you have options. There’s a lot of options out there when it comes to filing systems. Even though more and more documents in the workplace are strictly digital, there’s still a strong need for organized physical filing in most offices. If your office has a high volume of physical documents that need to be kept orderly and safe, the right filing system can make all the difference. Here are a few options, plus their pros and cons. Just like the names suggest, vertical files are taller than they are wide, and lateral files are wider than they are tall. Lateral files are more versatile than vertical files since they can accommodate both letter and legal size paper. Vertical files come in either letter or legal sizes. Vertical and lateral files come in two to five drawer sizes depending on how much storage you need. Lateral files have the added option of either 36 inch or 42 inch wide models. Nothing looks quite as classic as a bookcase. While they don’t offer the best storage-to-space ratio, they are the most stylish choice for offices that don’t have an exorbitant amount of physical files to store. If you work in an office that relies on an extremely high number of physical files for everyday operations, then you made need a filing system. These allow you to make the most of your space by using moving cabinets to increase storage capacity. Mark Downs is happy to help you get the most productive, creative, and positive conference room and work environment possible through our office furniture and design expertise. We have the expertise and equipment to ensure your conference room is attractive, productive, and a wonderful hub of activity in your office. 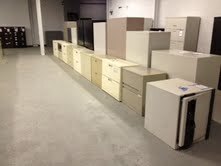 Stop by our Cockeysville showroom to see what we can offer or give us a call at 410-771-6800. To see examples of our work and what we are up to, follow us on Facebook, Twitter, LinkedIn, and Pinterest. This entry was posted on Friday, July 15th, 2016 at 2:09 pm. Both comments and pings are currently closed.